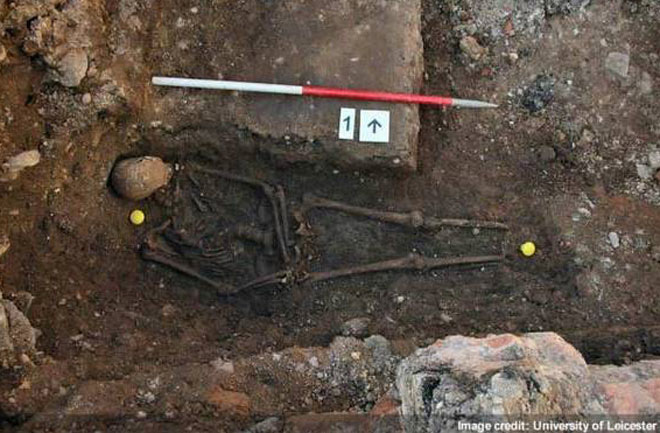 he body of the lost and vilified English king Richard III has finally been found. Archaeologists announced today (Feb. 4) that bones excavated from underneath a parking lot in Leicester, "beyond reasonable doubt," belong to the medieval king. Archaeologists announced the discovery of the skeleton in September. They suspected then they might have Richard III on their hands because the skeleton showed signs of the spinal disorder scoliosis, which Richard III likely had, and because battle wounds on the bones matched accounts of Richard III's death in the War of the Roses. The announcement comes a day after the archaeologists had released an image of the king's battle-scarred skull. To confirm the hunch, however, researchers at the University of Leicester conducted a series of tests, including extracting DNA from the teeth and a bone for comparison with Michael Ibsen, a modern-day descendant of Richard III's sister Anne of York. Indeed, the researchers found the genetics matched up between Ibsen and that from the skeleton. "The DNA remains points to these being the remains of Richard III," University of Leicester genetics expert Turi King said during a press briefing. 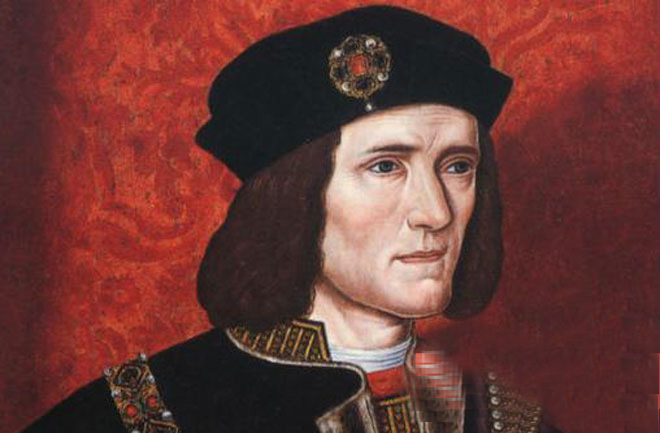 Richard III's historical reputation is a twisted one, rife with accusations that he had his two young nephews murdered to secure his spot on the throne. The Shakespeare play "Richard III" cemented the king's villainous reputation about 100 years after the monarch died. The remains of what may be King Richard III, showing a curved spine and signs of battle trauma. But Richard III's true legacy is a source of controversy. According to the Richard III Society, which has been involved in the archaeological search for the king's remains, many of the crimes Shakespeare attributes to Richard III are on shaky grounds. Even the deaths of the young princes remain in dispute. After the king's death in battle, he was brought to Leicester and reportedly interred at the church of the Grey Friars, a location long lost to history. Unsubstantiated rumors sprung up around the missing grave, such as that Richard III's bones had been dug up and thrown in a river, or that his coffin was used as a horse-trough. Relying on historical records, University of Leicester archaeologists began excavating a city council parking lot in Leicester in August 2012 in search of the Grey Friars church. They soon found medieval window frames, glazed floor tiles and roof fragments, suggesting that they were on the right track. Shortly thereafter, the team unearthed human remains, including both a female skeleton (possibly an early church founder) and a male skeleton with a spine curved by scoliosis. The male skeleton's skull was cleaved with a blade, and a barbed metal arrowhead was lodged among the vertebrae of the upper back. An analysis of the skeleton, ongoing ever since, revealed many characteristics consistent with Richard III, including that the man died in his late 20s or 30s (Richard III supposedly died at age 32), and he had a slender, "almost female build," said Jo Appleby, the University of Leicester's osteology expert. The man would've had so-called idiopathic adolescent-onset scoliosis, meaning the cause is unclear though the individual would have developed the disorder after age 10; the curvature would've put pressure on the man's heart and lungs and could've caused pain, Appleby said. However, unlike historical records would suggest, the skeleton of Richard III showed no signs of a withered arm. Appleby and her colleagues found and examined 10 wounds on the skeleton, including eight on the skull. None of the wounds could have been inflicted after the body was buried, though some of the wounds are consistent with being post-mortem, possibly as a way to further humiliate the king in 1485, Appleby said. What does the discovery mean for the king's villainous reputation? "It will be a whole new era for Richard III," Lynda Pidgeon of the Richard III Society told the Associated Press. "It's certainly going to spark a lot more interest. Hopefully people will have a more open mind toward Richard." Where will they be re-interred? The University of Leicester has jurisdiction over the remains, and said today the Richard III skeleton would be buried under Leicester Cathedral. Other interested parties had voiced their own opinions: The Richard III Foundation and the Society of Friends of Richard III, based in York, England, argue the remains should be reburied in York, since the king was fond of that city. The Richard III Society has remained officially neutral. Meanwhile, some online petitions have argued the reburial should take place at Westminster Abbey or Windsor Castle.